Time for a new recycled plastic bag project. Things have been a little hectic lately and I haven’t been able to craft and post new patterns as frequently as I would like. But this week I was able to get some plastic newspaper bags cut up into plastic bag yarn. I just love this beautiful shade of pink salmon that my local library gets their newspaper delivered in. For those people who may have not read my fat bottom bag post, these beautiful bags are being saved by my local library. I pick them up about twice a week and it’s a wonderful resource for me to be able to obtain unique and colorful bags for my recycled crafting projects. I actually counted the number of bags I used in this crocheting project. It was 29 plastic bags. I cut them about 1 inch wide and interconnected them together using the loop method. Each newspaper plastic bag results in about 17-18 loops if anyone is interested. Anyway this water bottle holder holds a 32 oz Nalgene bottle or a store bought 1 liter bottle of water. Because these plastic bags are a bit thinner I used a K crochet hook rather than my standard N hook. 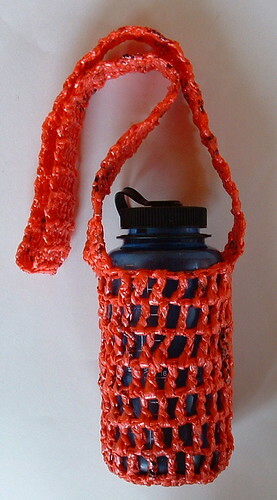 The smaller hook provided a tighter stitch and a sturdier water bottle holder. Please enjoy the free crochet pattern below and happy crafting to all! Material Needed:	29 salmon pink newspaper plastic bags cut into 1 inch strips and connect into plarn. just as you do in this plarn making tutorial.